Here is something to chew on for all fellow philosophical souls out there. It offers, hopefully, more than the ivory-towered entertainment that theologians and philosophers tend to indulge in, oftentimes at the expense of a real engagement with people and their problems. The reading below (right at the end of this introduction) is intended to convey something that, when correctly understood, may quite literally change the course of a person’s life. And so it is (potentially) extremely practical and applicable for our walk with Christ. Simply put, the meditation has to do with the nature of eternity that enters the life of the regenerate, not at the moment of their physical death, but at the moment of their spiritual death and regeneration. To live in eternity is to have time and space suspended in the way that most of us experience it. 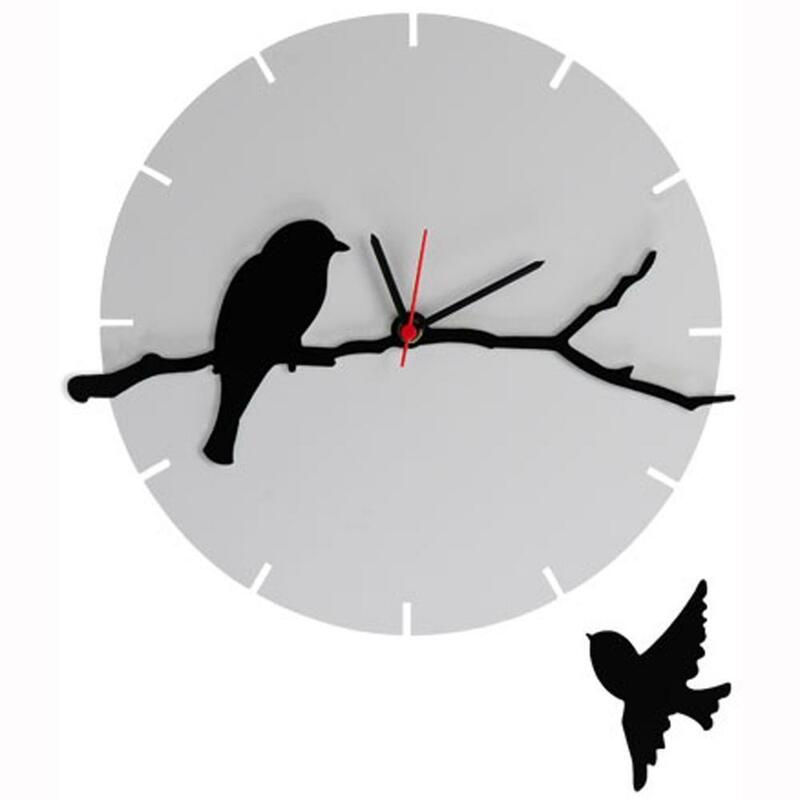 We oftentimes try and interpret the idea of “eternity” from our own finite perspective of time, and we end up with time “extended” (remember the illustration of the little bird sharpening its beak on the diamond mountain?) rather than time “suspended”. 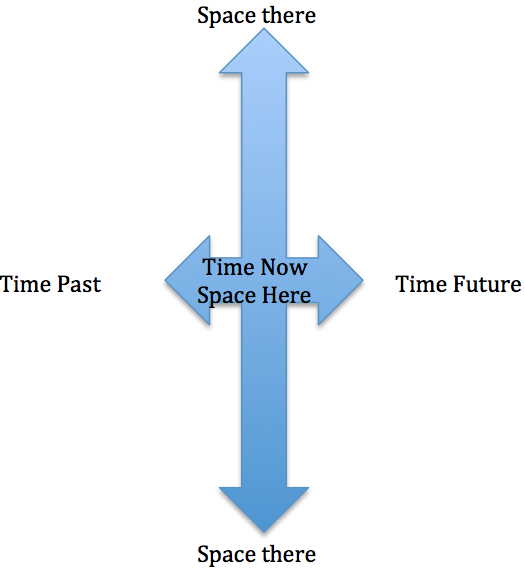 Eternity is not a “lo-o-o-ng” time, but an eternal now, which is what the meditation aims to illustrate. The point is that a real encounter with perfection suspends the need to dwell on the past (Solomon’s prohibited question in Ecc.7:10: “Why were the old days better than these?”) or the future (The refrain of discontent: “If only…”). Of course a dwelling on the past can be negative (regret or shame rather than nostalgia, i.e. the “if only…” sentiment in reverse gear – What Martyn Lloyd Jones dubbed “Vain Regrets” in his classic Spiritual Depression) and so can be an imagined future (fear in the place of lust: “What if…”). But even negative manifestations of retrospection and visioneering are suspended in the presence of perfection. And so the problem of sin, which is the problem of discontent and its perceived antidote “desire” (See post here), dissipates in the atmosphere of perfection. The idea that something greater lurks in the future than in the present was, of course, introduced by the serpent. I elaborated on this in two posts here and here and will refrain from doing so in this post. A final word: The normal Christian life is clearly designed by God to frustrate our projections of an idealised future inhabited by an idealised self, for this is the essence of what it means to fall into the power of the evil one, as the Eden tragedy reminds us. It is also, I believe, this idea that will contribute to Scripture’s “great apostasy” more than any thing else, and I suspect it has already begun. An “imagined self” lies at the heart of all idolatry. It deceived the first Eve, who typified the bride of Christ, and it will deceive the second Eve, the church herself. Satan’s strategy has not changed, and neither has our gullibility. Note that God’s manna, the bread from heaven who is Christ, lasts for one day only. Note that the exodus was designed to frustrate the very idolatrous excitement that made the people sing the song of Moses (Ex.15) whilst anticipating milk and honey instead of daily bread. Note that the way in which God “tested” them, to see “what was in their heart, whether they would serve him or not”, was by frustrating their future expectations. Note that the lesson following the test (See Deut.8:3 and on) did not only have to do with substance (every word of God instead of bread alone), but with timing (a daily partaking in the place of an anticipated future). Note that the stubborn refusal of the “imagined future” to come to realisation inspired the act of forcing it into existence through a golden calf. Note the correlation between the golden calf event and Nebuchadnezzar’s “golden image” which he constructed in response to God’s revelation that his rule was but a temporary and ultimately futureless one. Note Jesus’ reference in Matthew 6 to the gentiles “running after these things”, namely the concern about tomorrow and how to prepare for it. Note Jesus’ response in Luke 12 to a man who was worried that he would not receive his anticipated inheritance from his brother. This response included a story in which Jesus contrasts the birds and flowers, who receives daily from the hand of God, with the rich man who spend his entire life storing up for a perfect future – one that was taken from him as it arrived. Note the fact that the benefits of the most famous “Lord’s Prayer” lasts only for one day only, and that it has to be repeated every day – in the day for the day. Note that the great revelation of what it means to be a disciple hinges on a single statement, namely to “take up your cross daily”. And note that the only legitimate “hope” in Scripture is the hope of the resurrection, and herein is our visionary instincts satisfied. “It is a peculiarity of man that he can only live by looking to the future, and this becomes his salvation in the most difficult times of his existence”, wrote Frankl in Man’s Search for Meaning. He was right, and the observation made him famous. But of course he never pointed out that this peculiarity of man was intended to draw his gaze from the present age to the age to come, and not to some imagined future within the present age. 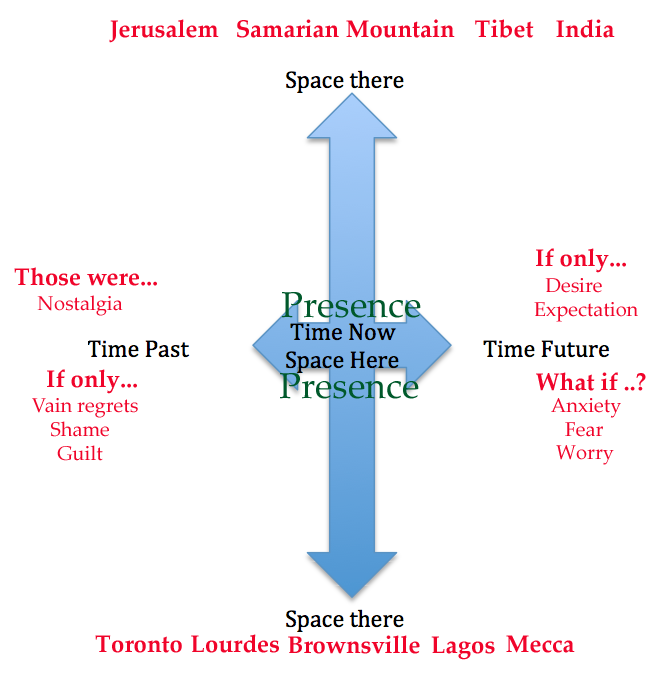 The “here” of space and the “now” of time intersect in an eternal concept called “presence”, signifying both locality (you are “with” us, that is, you are “present” as opposed to “absent”) and interval or moment (you are so at the “present”, as opposed to the “past” or “future”). We therefore see that the presence of a person cannot be due to recollection or projection. Both the past and the future make existence impossible as it obliterates presence. Thus, for the self to be alienated from the self, resulting in the tragic and inevitable annihilation of the self, what we term “death”, the self must be removed from the present into the past or the future. This removal we see expressed in the shift from the divine “I am” (Ex.3:14) to the demonic “I will” (Is.14:13-14). The latter we can refer to as the appearance of “becoming” in the place of “being”. Existence stands opposed to imagination. Presence is immune to imagination, for the reality of presence overrides imagery, but the past and the future is bound to imagination. This means that the self of the past or the future is of necessity an image, and that it is dead. It has departed from the intersection of the present. “I will” is death, “I am” is life. “I will” is the confession that removes one from the eternal moment of the present. This experience of death is felt in the sentiment of desire, and it is kept alive by the sentiment of anticipation. To desire is death. To anticipate is death. The image is always desired and anticipated, and it always destroys presence. Needless to say, the death resulting from “I will” (The devil in Is.14) is transferred through the code “you will” (the serpent to Eve in Gen.3) and collectively expressed in the confession “we will” or “let us” (the builders of the tower of Babel in Gen.11). The seed of death is transmitted in this manner. For the destruction of the unity between two selves, i.e. between two or more individuals, the same annihilation is called for, namely the exchange of “we are” (“I am” in the collective sense, the confession of identity found and celebrated) for “let us” (identity as a wish dream, the anticipation of “a name for ourselves”). Babel does not only provide the historical narrative of disunity, but also the cause thereof, namely the act of collective visioneering. Images relate no more than phantoms, this story teaches us. And here is the conclusion of the matter: To walk in an exceptional manner with Christ is to apprehend him in the moment, not to anticipate him sometime in the future of this age (The second coming excluded, as that is the beginning of the age to come). A projection of his presence to an imaginary idealised setting (next week’s church service, next month’s healing revival, my spirituality if I can only…, etc.) is to be left without that presence in the now, for how can we throw something towards the future and still cling to it? To abide in Christ, and to fellowship with the body, can only happen in the now. Presence and present is inseparable. Herein is the antidote to the curse of good intentions never carried out. Herein is true contentment and the annihilation of desire. Herein is the experience of the fullness of God. Herein is the eternal Sabbath. Herein is the fulfilment of the law. Herein is the love of God.